Postcards from the Attic: More chickens! 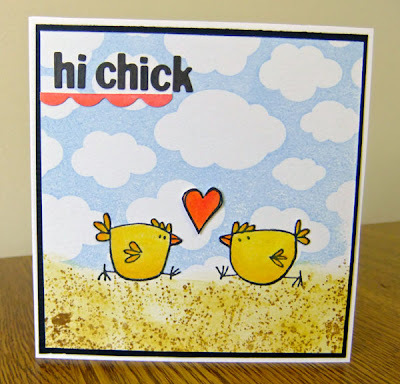 Another of my chicken cards today. This one uses the Artemio stamps as before and also a Hero Arts background 'Clouds' and a Tim Holtz dotty stamp to create the gritty texture on the ground. The heart is just doodled. ps...no change here at home with things, alls still the same as when we last spoke. Into the sixth week now. Love it! note to self - must get those stamps! Love those chicks!! Super cute card. I just signed up to follow you. Please drop by my blog, I started blogging and papercrafting at the end of June this year. Hope to see you soon. From the fab cloudy sky to the wonderful wheaty ground, these chicks are just too fun!